Indie Retro News: Never released Defender of the Crown for the ZX Spectrum revealed! Never released Defender of the Crown for the ZX Spectrum revealed! One game I remember so fondly, one that will be in my mind till the day I pass, is Cinemaware's fantastic medieval game ' Defender of the Crown ' from 1986. It was released for multiple systems including the Amiga, DOS, NES, Atari ST, Amstrad CPC, C64, Macintosh and the Apple IIGS in 1988 with a CD-i version released later. A grand game with jousting, rescuing damsels in distress, conquest and even catapults again castles that sadly never appeared on the ZX Spectrum as a commercial product by Mirrosoft. 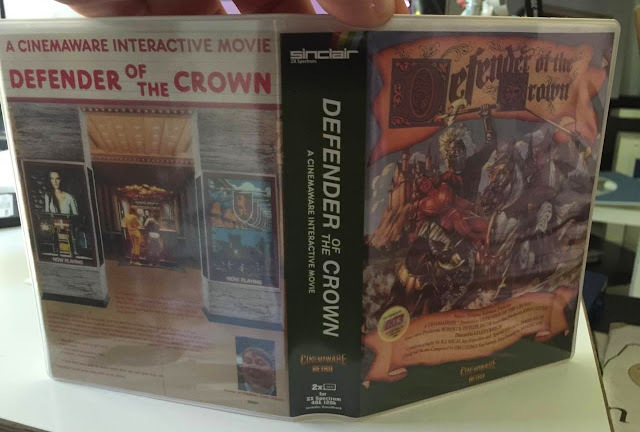 But now, thanks to a contact by none other than Cinemaware, they have revealed a full version of Defender of the Crown for the ZX Spectrum which will be released! According to Cinemaware there will be 2 Tapes, one with the game and one with the soundtrack. Manual, small poster and Sticker. They will be limited to 250 units for 19,95 Euro. Also as another bit of information they will also soon be announcing the pre-order details for Rocket Ranger Extended Collectors Cut. What a fantastic Thursday this is turning out to be with nonstop retro gaming news from around the world!